IMAGE: On Jan. 7, RapidScat saw Tropical Depression 1C's strongest winds (red) southwest of the center at 30 meters per second (67.1 mph/ 108 kph). The Central Pacific Ocean's out-of-season tropical depression has strengthened into a tropical storm and has been renamed Pali. NASA's RapidScat instrument and Terra satellite gathered wind and temperature data on the unusual storm far to the southwest of Hawaii. 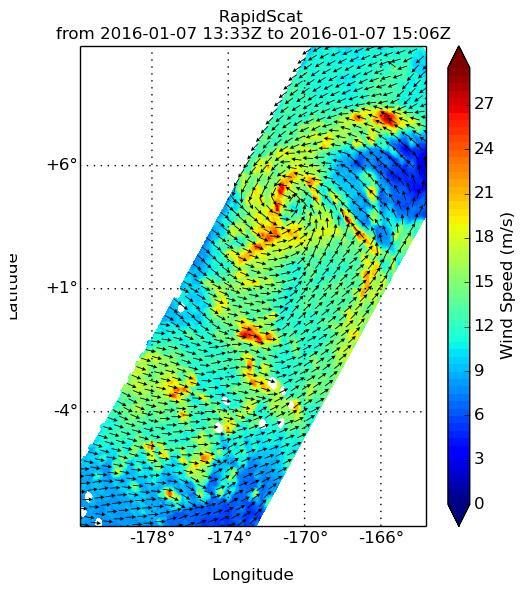 On January 7, the RapidScat instrument that flies aboard the International Space Station measured the surface winds in the then tropical depression 1C. RapidScat measures wind speed at the surface which is always lower than speeds at higher altitude. Maximum sustained winds are not always equally distributed in a hurricane or tropical storm, and the RapidScat instrument helps forecasters find the strongest quadrants of a storm. Tropical Depression 1C's strongest winds appeared in the southwestern quadrant of the storm at 30 meters per second (67.1 mph/ 108 kph). Winds around the rest of the depression were less intense. By Jan. 8, the depression strengthened into a tropical storm. On Jan. 8 at 09:35 UTC (4:35 a.m. EST) the Moderate Resolution Imaging Spectroradiometer or MODIS instrument aboard NASA's Terra satellite measured temperatures of Pali's cloud tops. MODIS data was false-colored at the U.S. Naval Research Laboratory in Washington, D.C. and showed powerful thunderstorms with cloud top temperatures between minus 70 and minus 80 degrees Fahrenheit (minus 56.6 and minus 62.2 Celsius) circled the center. On Jan. 8 at 0900 UTC (4 a.m. EST/ 11 p.m. HST Jan. 7) the center of Tropical Storm Pali was located near latitude 5.9 north and longitude 171.8 west. That's about 1,410 miles (2,275 km southwest of Honolulu, Hawaii and 760 miles (1,255 km) south-southwest of Johnston Island. Pali was moving toward the northwest near 8 mph (13 kph) and a turn toward the west-northwest is forecast by late Saturday. Maximum sustained winds were near 50 mph (85 kph) and little change in intensity is expected for the next 36 hours with slow weakening expected thereafter. The estimated minimum central pressure is 997 millibars. The storm is not a threat to any land areas. Forecaster Wroe of NOAA's Central Pacific Hurricane Center said that since Pali is located in the deep tropics "ocean temperatures are sufficiently warm for additional intensification." However with easterly vertical winds shear around 25 knots (28.7 mph/46.3 kph), some data indicating some westward tilt with height to the cyclone and continued interaction with the low level trough (elongated area of low pressure) the potential for intensification is limited over the next few days. For updated forecasts on Pali, visit: http://www.prh.noaa.gov/cphc.